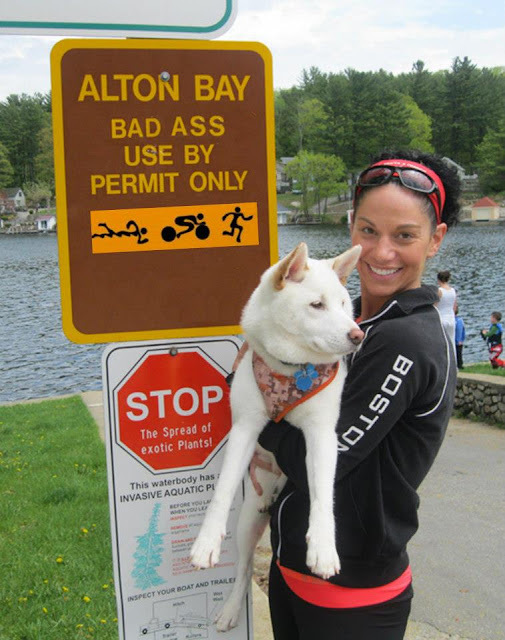 - Sunday we headed towards Lake Winnipesaukee to hike Mount Major with Cole, a Shiba Inu that Alton was dogsitting. I had never been to Mount Major and was looking forward to a small hike with nice views. This would be Cole's first hike so I was interested to see how he would do. Plus he's a white fur-ball and was secretly hoping he'd roll in some mud! - Mount Major sees plenty of foot traffic as it is a very easy hike that is great for newbies and families looking to get into hiking. There is a nice rock slab section with great views down to Lake Winnipesaukee and the Ossipee Range as one ascends the Mount Major Trail. Views from the summit are magnificent, one of the best for a sub 2,000 footer. - Cole did well on the flat and downhill sections of the hike but was unsure and skittish at times on the uphill parts. However, he kept a good pace and never needed to stop from being tired, it seems like he could become a great little hiking dog! His biggest adventure was his first water crossing where he had no clue what to do and was afraid but eventually made it across safely with a little help from alton. Then, ten minutes later we reached another small brook crossing and he just walked right through it without a care in the world! - It was a fun little hike and Alton was happy since we got to drive through Alton Bay! Cole, looking thrilled to be hiking! Cole learning how to cross a brook! Cole a pro at brook crossing! Tourist time, the photo-shopped sign says it all! Mt Major is a great hike, straight up and to the view, which is beautiful all 4 seasons. I Found a newt on mt Israel a few years back but it was green with orange spots. Alton and Newt have the same fashion sense. Florescent rules. I enjoyed Mount Major, it was my first time on it. Alton always wears colorful clothes, she bring fashion to the Mountains! Glad you enjoy the report and pics, thanks!